It is fairly certain that the eighteenth century village of Leamington Priors had only the most basic equipment for use in the event of fire. 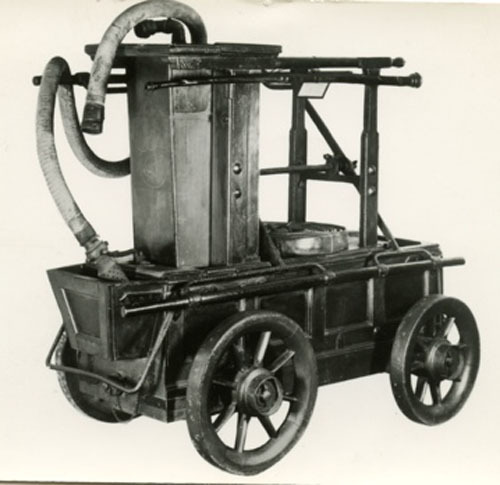 Although larger towns and cities might boast one of the early manual fire engines, in villages up and down the land the firefighting equipment generally consisted of a few strategically sited water-filled barrels and some leather buckets. These might be provided by the Lord of the Manor and not infrequently by the Vestry. The exploitation of the saline springs and the rapid increase in the population of the village raised concerns about the inadequacy of such arrangements in a town where modest half-timbered cottages were making way for grand terraced houses, four storeys tall. The first reference to a fire engine in Leamington is in 1824 when the Leamington Priors Vestry asked the All Saints’ Churchwardens to provide ‘a place for the reception of the fire engine’. By September of 1824 the engine house in the churchyard had been completed and a fire engine provided by the Birmingham Fire Office was installed. What must be appreciated is that there was no recognised means of raising an alarm of fire and that even when the engine had been sent for there would be at most only two or three people who actually knew how to operate it and no designated group of townsfolk to get it to the scene of an incident. From the moment the engine house doors were thrown open, the entire operation relied almost entirely on help from well-intentioned members of the public to manhandle the engine to the fire and then to man the pumping handles. In the Summer of 1825 The Leamington Paving Act was passed which enacted inter alia a number of building regulations covering the provision of party walls, the use of thatch for roofing and more importantly, the Act authorised the appointment of Improvement Commissioners with wide-ranging powers among which was the legal authority to purchase and maintain fire engines ‘belonging to the said parish of Leamington Priors’ and to levy a parish rate for the purpose. The ongoing expansion of the new town led to decades of civic browbeating as to the inadequacy of the firefighting arrangements then in force. Building insurance dates back to the period following the Great Fire of London in 1666 and it was the insurance companies which provided most of the firefighting hardware nationally until the middle of the nineteenth century. In some of the larger towns and cities they established the first professional Fire Brigades. In less populous places such as Leamington, they were ready to donate manual fire engines which would ensure that the properties on their books would be afforded adequate protection, thus reducing any financial payments they might have to make in the event of a fire. Apart from these insurance engines, many owners of large houses and country estates owned fire engines for the protection of their own property. In 1833 Matthew Wise offered to give the parish of Leamington Priors his engine when the Vestry again raised concerns about the level of protection. By the middle of the nineteenth century, the Birmingham Fire Office had supplied three manual fire engines to the expanding town. These were housed in part of a shed in the Commissioner’s yard in Court Street, next to the Parish Workhouse. A long ladder is said to have been hung on the wall in Regent Grove. The Birmingham Fire Office engines had been taken over by the Police Committee by 1837. The Commissioners arranged for one of their men to operate the engines when required and the Parish Constables no doubt had some part to play but there was still no organised fire brigade of any description to man any of the appliances which would require at the very least ten men per engine to operate the pumping handles. A lack of use and of any regular maintenance or testing meant that the leather hose and pump fittings quickly perished. The Vestry Minute Books contain numerous references to equipment being ‘decayed’, ‘rotten’ and ‘not fit for use’. It took a fire of serious proportions to bring about a fundamental change in the ramshackle and inefficient arrangements for fire protection. In June 1850 the extensive premises of Mr John Dowler, Upholsterer and Cabinet Maker of Regent Place were completely destroyed in a fire. The damage was assessed at £30,000 a huge sum which in today’s values equates to about £2 million In the weeks following the fire, the correspondence columns of The Courier carried many letters critical of the lack of a properly equipped and trained Fire Brigade in Leamington. Such was the urgency with which local issues were addressed in 19th century Leamington that a further six years were to elapse before these aspirations were realised. In July 1856, a local coal merchant Thomas Muddeman proposed the establishment of an efficient Fire Brigade and in September of the same year the Police Committee reported that an Honorary Fire Brigade of sixteen men had been formed. Half of the volunteers were plumbers, others were connected with the building trade and one (Henry Davis) was a chemist. The town of Royal Leamington Spa, population about 16,000, had for the very first time a body of men properly trained and equipped to deal with the dangers of fire. The small market town of Southam, population about 1,600 had formed such a Brigade over forty years earlier.